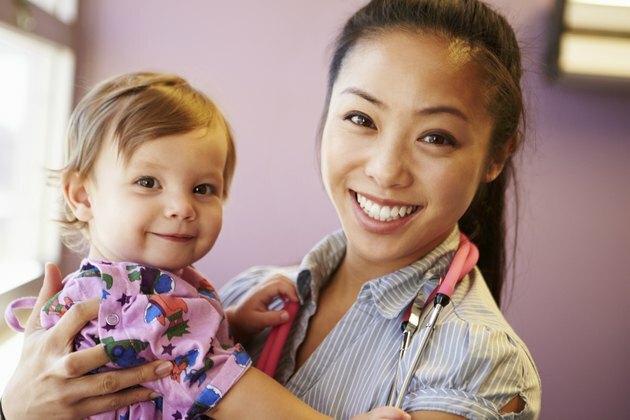 If your baby has fallen on her shoulder or received a blow to her clavicle, it’s possible for her to end up with a partially or completely dislocated shoulder. This happens when the humerus bone in the upper arm comes out of its socket, tearing or stretching the muscles and ligaments. While it’s not a common injury in babies, it does happen, and there are specific symptoms to look for. If the humerus has slipped out of its socket, the ball at the top of the bone, which is called a humeral head, usually ends up in front of the joint; sometimes, if the blow has come from the front, it may end up behind the joint. This positioning can cause swelling or a deformed look to the shoulder area. Another variation on the injury is a separated shoulder, which occurs when the joint between the collar bone, or clavicle, and the shoulder blade is dislocated. This may look like the shoulder’s contour has a dip in the middle of it. If your baby’s shoulder is dislocated or separated, you may notice that the area around the shoulder is red, or even bruised. Any discoloration of his skin that happens after a fall or a hard blow is an indication that there may be a dislocation, and it needs to be checked out. Your baby won’t be able to tell you that she’s in pain, but you can expect a lot of crying if her shoulder is dislocated. You may even notice that she doesn’t move her arm as freely as she did before. If you suspect your baby’s shoulder is dislocated, take her to the emergency room or to see her doctor. X-rays will likely be taken to determine the extent of the injury, and you’ll be asked to apply ice to the area to reduce the pain and inflammation. Medication may also be prescribed, and a sling, splint or cast will probably be used to hold the arm in place while it heals, which usually takes four to six weeks.